Bentonville, Arkansas is the birthplace of our largest retailer, which is Walmart. Not surprisingly, the city sees thousands of visitors each year as people travel to discover the wonder of Walmart and learn its roots by visiting the Walmart Museum. Whether you’ve come to check out the sites, or you’ve just moved to the area, you don’t want to wait precious time by searching everywhere for a dentist should an emergency arise. Emergencydentistsusa.com is here to provide you a quick and simple solution to your dental needs when you’re unfamiliar with an area, or just simply don’t have the time to do the research that goes along with finding a new dentist. Our site lists the available dentists, some of the services that they offer, the hours that they are open, and even the types of insurances that they accept. If you’re running low on time or don’t have access to the Web, you can call our 24 hour free dentist finder hotline. One of our kind and experienced operators will be glad to assist you with your search. Once you’ve decided on the office you would like to visit, they can even set your first appointment and provide you with directions to get there. As with all first time appointments, make sure that you arrive at least 15 minutes early. Bring with you a valid ID, a copy of your insurance card if you have one, a list of any medications that you’re currently taking as well as any allergies you may have, and also any copay that will be due at your time of service. Description: Bentonville Family Dentistry enjoys providing their patients with brand new smiles. They want everyone to be proud of their smile and they will offer each treatment to their patients in order to help them achieve the perfect smile they’ve always dreamed of. They will redesign your smile into the smile that you have always wanted. Description: My Village Pediatric Dentistry provides their young patients with healthy and happy smiles! They teach young children how to achieve the best smiles possible by using preventative maintenance techniques. With a bright ad friendly environment, they are one of the best places around to take your children for dental care. Description: Bentonville Smiles enjoys giving their patients beautiful smiles that will last them a lifetime. Dr. Remerscheid works one on one with his patients to build a treatment plan that will work with their schedule as well as their budget. Since he also offers orthodontics, you can get the absolute best smile possible by visiting this office. If you’ve suddenly started experiencing tooth pain, it’s important to go to your dentist right away. Never let the pain persist longer than a couple of hours. If you’ve experienced any type of trauma such as a car or a sports accident that affected your mouth, then you need to go to your regular doctor to be checked prior to going to the emergency dentist. Once a doctor has ruled out that you’ve broken any bones or gotten a concussion, it will then be safe to allow a dentist to handle your mouth pain. If you haven’t experienced any trauma and the pain has just set in, then it is likely that you’re dealing with some sort of infection. This will need to be treated right away to prevent damage to other teeth and your gums. 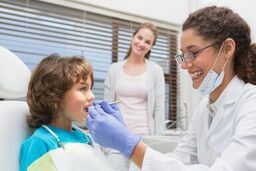 Any time you’re going to a dentist or doctor for the very first time, it’s always a good idea to check their licensing and credentials with the state. After all, you do want to be certain that you are receiving qualified help. Most patients choose to check that information when they go for their first appointment at the new doctor’s office. If you’d like to check prior to going to the office, you can enter the doctor’s name on the Arkansas Dental Association website to view their information.